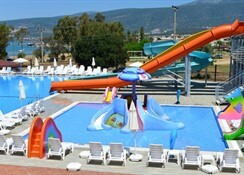 Ramada Resort Akbuk is located 800 m from the sandy beach. The closest city to the hotel is Didim (20 km). Other cities: Kusadasi (75 km). To make your stay more comfortable air conditioning, a hairdresser, a reception and a lobby are available. The staff in this hotel speaks English. A playground for children is available. 2 fresh water swimming pools are available. Sunshades and sunbeds are available free of charge at the beach and at the pool. Distance from the hotel to: airport BJV (44 km), Miletus (30 km), Sapli Island (5 km), airport ADB (142 km), Apollon Temple (20 km) and Heraklia (44 km). For your entertainment the hotel features a disco and TV lounge. Amenities: For convenience the hotel offers wake-up service, medical care, maid service, laundry service and room service. Internet access is provided at wifi-hotspots. 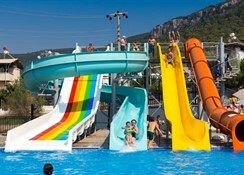 This family friendly hotel offers a child club and a children's pool to ensure a comfortable stay for parents as well as young guests. Reception hours: 24h Service. Meals: The breakfast type is Buffet and it is provided from 07:00 - 10:00. Evenings can be spent at the lobby bar. 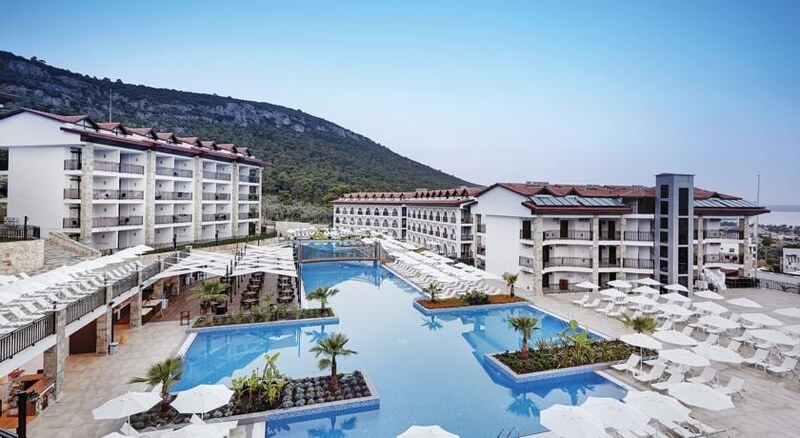 Sport and Leisure: At Ramada Resort Akbuk recreational amenities include a Turkish bath, a spa, a hamam, a steam room, massages and a sauna. Guests who wish to be active on holiday can enjoy activities such as aerobics, exercise in the fitness room and beach volleyball. Additional Information: Payment facilities include Visa Card and Euro/Master Card. Additional fees may apply for certain facilities, amenities or activities.